Quick Review: When a string of men vanish without a trace along the coast of France, Lilix Morgan seeks to uncover the source of the mysterious deaths. Aided by four other immortal Originals, they comb the coast, only to find out the horrible dark truth; one of them is the culprit. 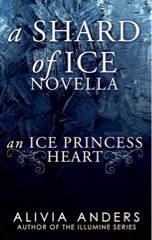 Detailed Review: This review might be short because An Ice Princess Heart is a novella that's 5 chapters long. But I do have lots of thoughts despite the book only having 5 chapters. What striked me the most was the writing style Anders has. I haven't read any of her previous Illumine books (although I'd like to now), so this was my first experience of this author. I had seen great reviews and ratings on this book on Goodreads so I thought that I should give it a try. And boy, was it worth it. I loved the author's descriptions that can somehow strike fear in your heart and make you connect with the characters no matter how short the book was. It's pure magic, I'm telling you. The characters were awesome too. Arabella made a great villain in the book and I love how the author portrays her as a bitter and angry person most of the time. I also thought that giving her the ability to create fire is another ace to developing her character and personality. Lilix was a great heroine and I'd absolutely love to have her powers! I want to make it snow in Malaysia! And down to the real deal, the story. The plot. It did seem simple to me, at first, but hindsight there are so many secrets to be uncovered as you progress more. These types of layered stories are usually what prompts me to give it a whopping 5 stars on the spot! But don't worry, I do still take the characters and writing style into account! If there's a great story with crappy characters, I absolutely won't give it a 5 star rating! Brief Review: I think if you stripped the book and left its story bare without any outstanding characters or suitable writing style, I would never give it a such a high rating. But as such, this book earns it with it's descriptive writing style and interesting characters together with it's entrancing story. I don't think I've read a novella that is as enchanting as An Ice Princess Heart. I can't wait to read the next book, An Ice Princess Kiss!